There are plenty of ways to reduce energy consumption, even while you're just hanging around the house. Doing so will not only be beneficial to the environment, it will save you quite a bit of money on utility bills. While you probably turn off household lights and appliances while you are at work, you might not be quite as energy-conscious when you're at home. You can reduce energy consumption on your off day, though. Just follow these easy steps. 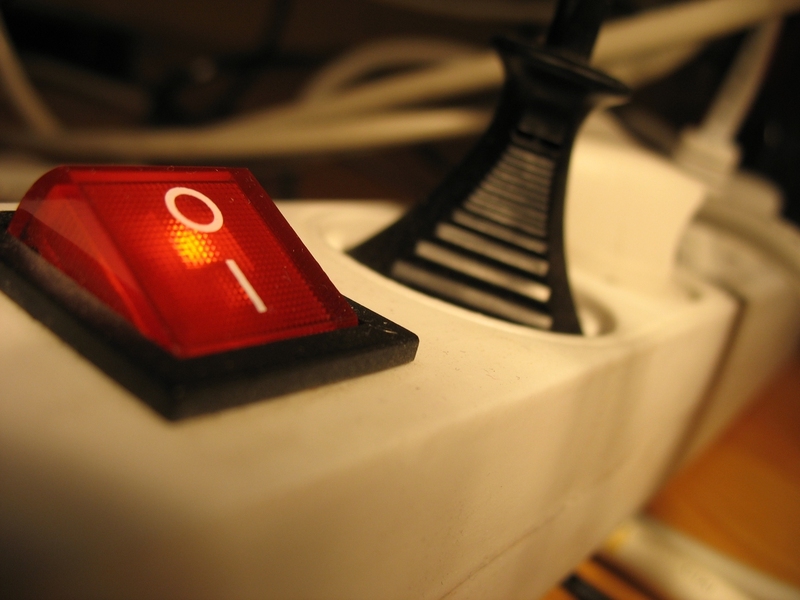 Even appliances that are not being used still use energy if they are plugged into an outlet. By simply unplugging these unused appliances, you can save a lot of energy and money. Appliances such as blenders and toaster ovens can easily be unplugged when not in use. Small gadgets, such as cell phone chargers, hair dryers, and cordless tools also add to an energy bill if not unplugged. Using power strips to turn off televisions, stereos, DVD players, and other home theater products will make it easier to turn this equipment off. Replace dial thermostats with programmable thermostats. This will allow you to set the thermostat to various temperatures throughout the day based on when the home is occupied. Doing so will prevent hundreds of pounds of emissions per year. In the winter, set the thermostat in the house to between 50 and 60 degrees Fahrenheit before going to bed or when going out for the day. Doing so will save quite a bit of energy. By lowering the temperature by just two degrees Fahrenheit, your house will emit 353 fewer pounds of carbon dioxide per year. Using sunlight wisely, you can raise the temperature in the house without having to turn up the thermostat. To do this, leave shades open on sunny days to warm up the home, but then close them at night to prevent heat loss through the windows. Dirty filters reduce proper airflow and waste energy. Your air conditioner must work harder if the filter is dirty, which, in turn, wastes energy. Changing it regularly can help. Set your computers to sleep mode when you're not using them. Setting them to hibernate after a certain amount of time will save even more energy. Turn out the lights when you leave a room. This simple action can save great amounts of energy. Replace incandescent light bulbs with more energy-efficient fluorescent light bulbs. This will reduce energy consumption by 75 percent. Fluorescent bulbs last longer, too. When using a laundry machine, keep the water temperature setting to cold. Washing clothes in cold water instead of hot water can reduce the washer's energy usage by almost 75% and can save almost 500 pounds of carbon dioxide per year. In addition, hang your clothes out to dry instead of using a dryer for more energy savings. Sealing air leaks is a simple thing you can do on your day off and is one of the most effective ways of reducing energy waste. Server responsed at: 04/19/2019 10:50 a.m.